That tree in the back of the yard. It’s probably an odd thing to say considering that we have lived here for 9 years. But, really, I never noticed it before and it is REALLY beautiful! This past Spring we had a large part of an old Sycamore tree taken down to keep it from falling. It was well over 60 feet tall and had already been relieved of 2 of it’s 3 trunks. It was tall, old, and wouldn’t look good toppled over the new fence or the pool. So, because of that, an amazing thing happened …I acquired a new view of the trees that line the back of our property line. And the view from my kitchen this Autumn is quite gorgeous … what a nice surprise while I enjoy my morning coffee! Then it happened – a storm blew in that brought very little rain, but a WHOLE lotta WIND. Shoot, those maples just can’t hold onto their leaves… Shame on them, why can’t they be like the mighty oaks? 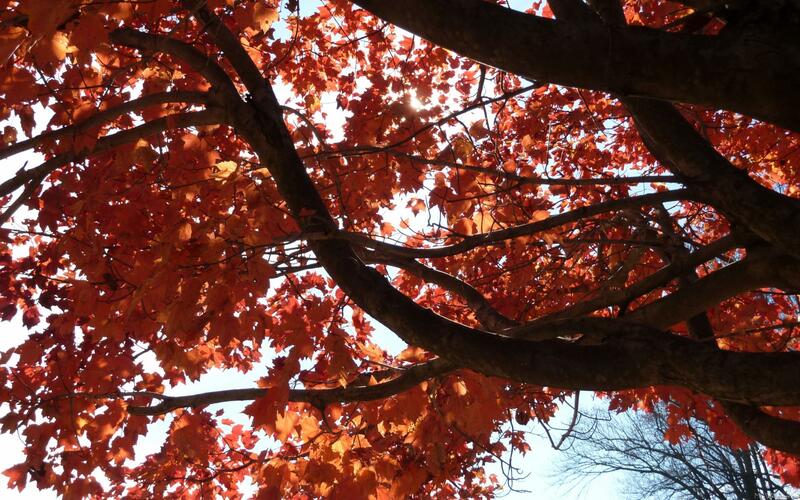 How quickly the beautiful reddish-orange leaves can disappear – almost as quickly as they appeared. Amazing how quickly the landscape can change – IF we don’t pay attention. I love hiking and am trying to manage to go once a week because the woods are changing so fast. That storm knocked many leaves to the ground this week and the freeze that occurred the week before? Well, it fried more than its fare share of the tall, green plants. So, each week, during nights and days that I wasn’t there, the woods kept changing. That’s nature. We, as humans, change too. Our hopes and aspiriations and sometimes the nitty-gritty days of marriage change as well. Especially when we aren’t paying attention and we are caught off guard by a huge storm that blows in. Something I’ve been noticing lately is how a shift has been occurring in my marriage due to my physical issues. These changes were forced upon me – meaning I didn’t see them coming – fought against them – succumbed to resistance in the change – then kind of threw my hands up in the air and pretty much wanted to quit. Change happens and so does unbalance in relationships. When this happens we need to address it and not be blind to it. It’s time to address the shift of balance in my marriage. Then, go to bed, wake up, and repeat. That is what gives me the chance to *sigh* at the end of the day. I love this man so much.